CD review: "Otis Blue/Otis Redding Sings Soul"
What further can be said about this album? It's one of the classics of soul, with the late Otis Redding at the top of his art. 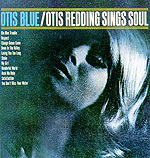 Originally released in 1966, "Otis Blue/Otis Redding Sings Soul" has classics such as "Respect" and "I've Been Loving You Too Long," and contains uniquely Redding versions of "Wonderful World" (which Nat King Cole had made famous), "My Girl" and the Rolling Stones' "Satisfaction." As the song titles suggest, despite the name of the album this isn't really a blues or soul recording. But Redding was, more so than other soul singers of his era, heavily influenced by the blues, using phrasing and shading drawn from the blues. The backing band is the best, with members of Booker T. and the MGs (Booker T. Jones, Steve Cropper and Donald "Duck" Dunn on keyboards, guitar and bass, respectively) and the Memphis Horns (Wane Jackson and Andrew Love), plus Isaac Hayes on keyboards. This is one of the absolute best recordings ever made; having such a classic reissued on a high-fidelity gold CD is a treasure for which we should all be grateful.